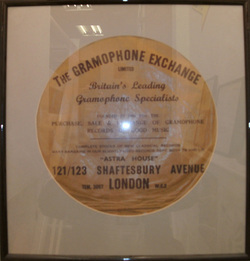 Gramophone Exchange, at that time in large premises on two floors in upper Shaftesbury Avenue. At one time the main, ground floor was for new records, the basement for secondhand, but the two got mixed up over the years. ‘Pop’ Russell ran it and tall Bill Snow sat by the window behind the counter. Some years later they moved to Wardour Street which I never liked so much. We were reluctant to take records in for sale to stern looking Mr Russell. At the far end of the earlier shop were those listening booths, musical retreats we all loved so much (except when other people opened the door with the same inquiry you got in phone booths). Selction from 1940's record buying experience . It was penned for Gramophone magazine in 1986. Name Warren Stutely Comment: Thank goodness someone remembers this wonderful place. I used it a great deal when I was a music student in the 60s. Many thanks. Warren. ( October 24, 2016). Bag donated by Johan Blazer and Derek Mann.